Top Bar gives you a great way to display important buttons and news right at the top of the page on medium or large screens. Publisher Top Bar has different styles and it can contain Sign in button, Newsticker, date and time and social networks. 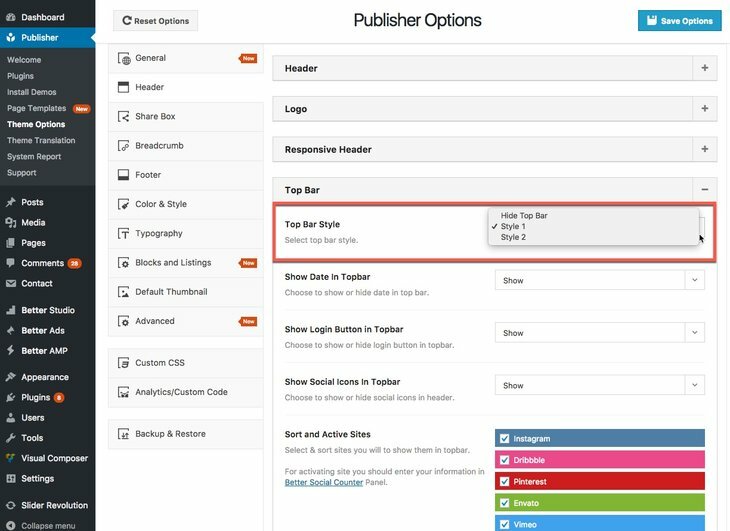 For customizing Publisher Top Bar go to Publisher → Theme Options → Header → Top Bar. 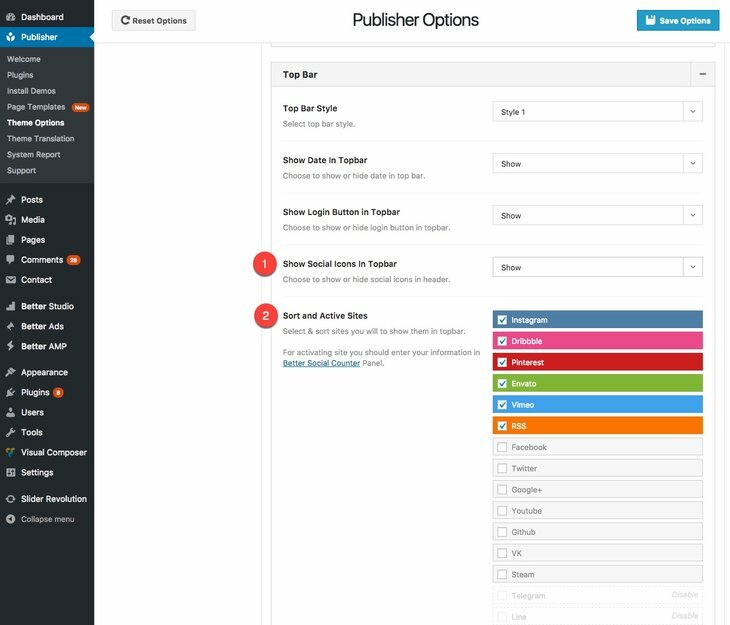 Go to Publisher → Theme Options → Header → Top Bar → Top Bar Style. Hide Top Bar: No Top Bar on your website. When you use style 2, an extra field for selecting Newsticker categories will be added. Green categories and sub-categories are selected and red ones are excluded. Don’t mark any categories to select them all automatically. 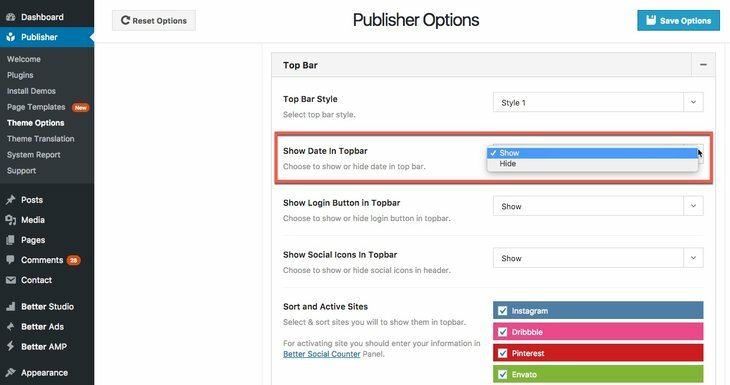 Go to Publisher → Theme Options → Header → Top Bar → Show Date in Top Bar. Remember this item is only available in Top-Bar style 1. Here you can show or hide displaying date and time in Top-Bar. How Can I Change Top Bar Time & Date Formatting? 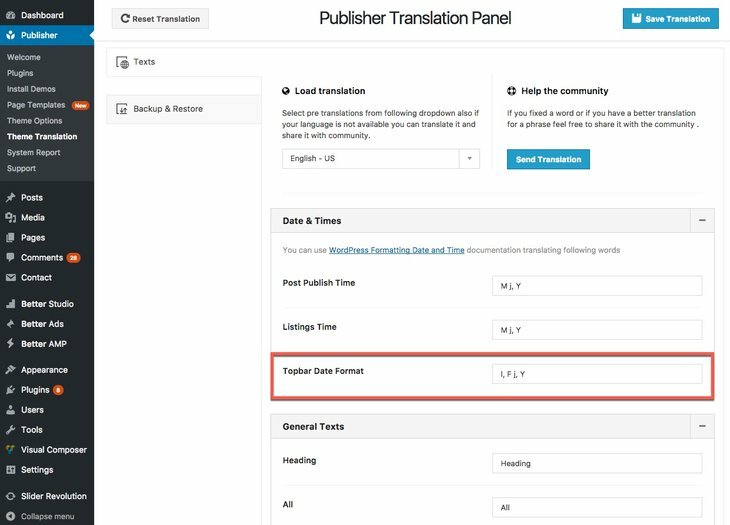 For changing date and time format go to Publisher → Theme Translation → Texts → Date & Times → Topbar Date Format. For further information about Time & Date formats, please read WordPress Formatting Date & Time. 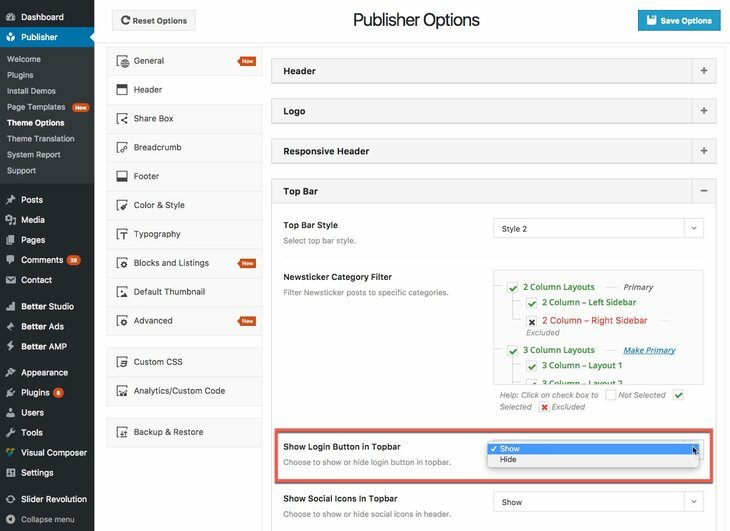 Go to Publisher → Theme Options → Header → Top Bar → Show Login Button in Top Bar. Show or hide Sign in button in Top-Bar from here. 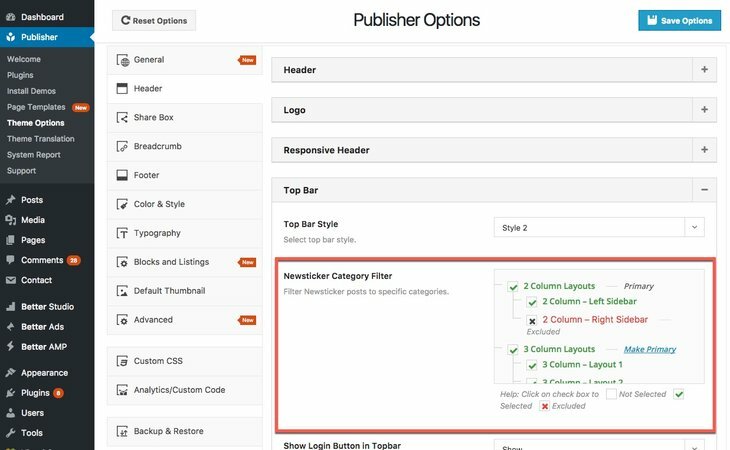 Go to Publisher → Theme Options → Header → Top Bar. 1- Show Social Icons in Topbar: Choose to show or hide social icons in header. 2- Sort and Active Sites: Select and sort your social networks link here. Check them to select and change their place by drag and drop. For customizing your social networks, go to Better Studio → Social Count. 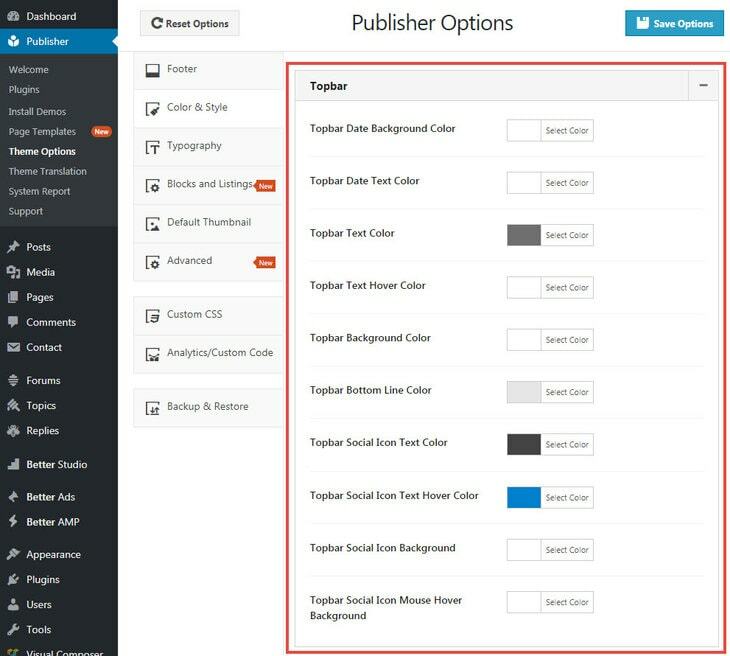 Colors & Styles is described before in Option Panels. In color & style, there is a accordion for Top-Bar. Here you can customize its different parts color. Read more about Typography Options in Publisher. There is a accordion for Top-Bar typography. You can change its menu, sub-menu and date typography in this panel. If you selected style 1 for top-bar, you see a menu in it. We discussed about creating menu and also managing menu locations; read these docs to know how to manage this menu.